Are you a tabletop role-playing gamer who has been wondering how to play Dungeons & Dragons and other RPGs with people online? Wonder no more! Check out weekly article at Nerdarchy.com. Notes: So, we come to the end, to The Wake, which here has double meaning. 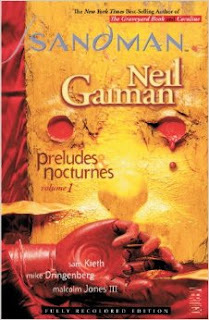 Without any doubt, I can say this is by far my favorite collection of The Sandman. Here we find what happens after Lord Morpheus reaches his ultimate fate, how others deal with it, how Dream (in a manner of speaking) deals with it, how the Dreaming changes, how the world has changed and goes on. This also includes my absolute favorite single issue of The Sandman, the one in which 600-year-old Hob Gaddling goes to a Renaissance Festival. All in all, the tale here is one of grieving, but one ultimately with sparks of hope. Mini review: This is what it's all about. 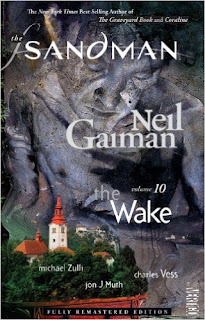 Technically speaking, this collection is the denouement of The Sandman, but I believe it hits its themes harder than did the actual climax. Love, forgiveness, a few tears, it's all here. For me, this is the best writing and the best art of the entire series. I've compared Gaiman's The Sandman to Shakespeare and Milton, and I stand by that, in no small part due to this collection alone. 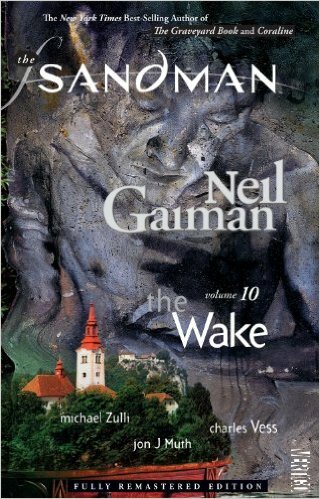 The Wake, a title with a double meaning, both of which are appropriate here. 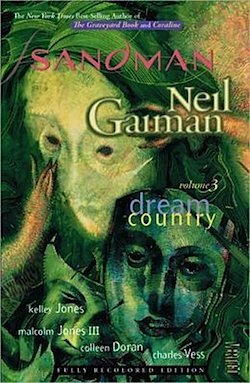 Notes: Though there is another collection after this one, The Kindly Ones really brings to fruition the resolution to Dream's story, or at least the portion of his story presented to readers in The Sandman. It is in many ways heartbreaking, and because of that this is probably The Sandman story line I've read the least. It's simply too painful. However, I know what's coming, so I'm at least prepared somewhat. Mini review: A lot comes together here, perhaps too much. For the first time, I felt there could have been some story chopping here, that there were too many resolutions for this one tale. Not that things felt forced, but that a little more of the focus should have been upon Dream than upon some of the ancillary characters. However, when the end comes, it does come rather quickly without a lot of maudlin carrying on, though by this point there has already been plenty of build up. I'm not sure what else to say here without giving away anything, which I do not want to do, but ... read this. Despite my grumbles, this is awesome work. Notes: A storm brings a group of characters together at an inn and they spend their time telling stories to one another. 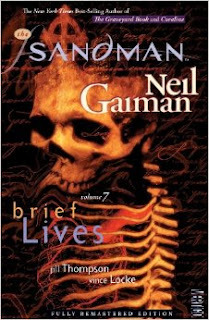 This is a collection of those stories, and they are mainly stories within stories, probably the more complex of the stand-alone issues within The Sandman. 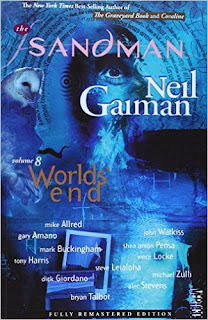 As should be obvious, Gaiman usually inserts a handful of shorter tales between each of the longer arcs within this series. There's good stuff to be found here, so I'm ready to dive in. Mini review: As mentioned, these are stories within stories, and sometimes they are stories within stories within stories within stories. Really. And it makes sense. Some familiar characters are to be found here, as well as plenty of new ones. Again, there are a number of allusions to Dream and the other other ongoing characters and the larger, broader tale. There is even some heavy foreshadowing of events to come towards the end of Worlds' End. There is some fine, short fantasy work to be found here, and I'd recommend to anyone. Notes: Here Dream goes on a quest with his sister Delirium. There's more to it than that, obviously, but the conclusion comes down to a matter of family, of sacrifice, and perhaps, of fate. This is the beginning of the end for Dream, where he seals his fate through an act of kindness. I'll say no more. Except for my mini review below, that is. Mini review: Thus the sadness begins, and the inevitability of fate. There is almost always some sadness surrounding the Dream character, though occasionally a sense of aloofness, but here is where it kicks in strongest for the series. For better or ill, it will continue throughout much of the rest of the overall story. At least in Brief Lives Dream got to see some old friends and relatives, but his actions seem ordained at this point. 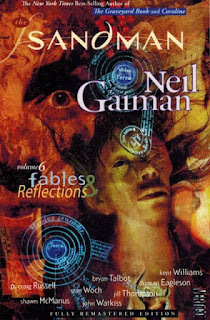 Notes: I've said elsewhere that the short stories, the one-issue tales, are some of my favorite parts of The Sandman series, and here we have another collection of them. These are a bit more thematically related than other similar collections, and here can be found quite a bit more about Dream's history. As always, looking forward to this. Mini review: As is much of The Sandman, these are almost entirely historical and mythological tales. Some favorites here, such as the story of Emperor Norton, that of Shakespeare, and others, though there isn't a bad tale in the lot. And though these are stories that stand on their own, it's always interesting to see how they tie in with the broader scope of The Sandman. 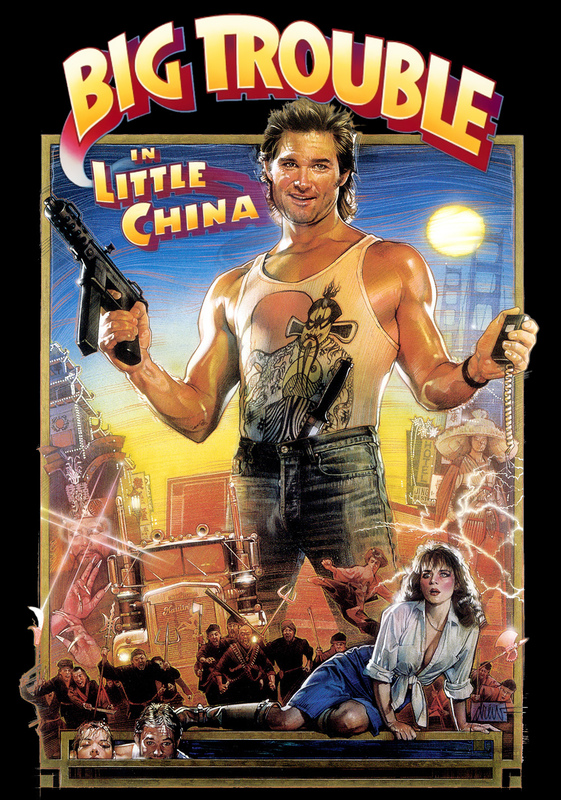 My Nerdarchy article this week takes a look back at the John Carpenter movie Big Trouble in Little China, starring Kurt Russell. Notes: From what I remember, this was my least favorite of all the Sandman story lines. That being said, perhaps this time I will find something new or maybe I will have a different attitude towards the tale. 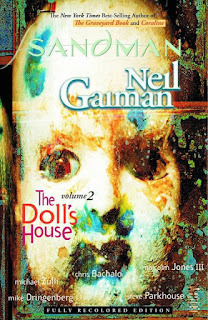 Mini review: It finally dawned on me after all these years why this is my least favorite of the Sandman tales. It is because Dream is not the protagonist. In fact, he barely appears except at the very beginning and then in the end. This is a common enough occurrence in the one-shot tales, but I believe A Game of You is the only longer Sandman story in which this is the case. That being said, I did find more to discover and more to enjoy this time around. Perhaps more than any other Sandman collection, this one foreshadows Dream's own fate, but it does so with several reversal twists, placing Dream himself in the role of another. I'm glad I read this again as it increased my appreciation for it. Notes: For me, this collection is where Sandman really comes into its own. Dream returns to Hell in order to set right a wrong he did many, many centuries ago, but when he arrives he discovers Lucifer is retiring, locking up and closing Hell and taking a permanent vacation in the Waking World on Earth. Unfortunately, as he is leaving, Lucifer gifts Dream with the key to Hell. At that point, Dream's existence doesn't become easy. But I've said enough. This has been one of my favorite sections of The Sandman, and as it's been a while since I've read it, let's see if it stands up well to time. Mini review: Yes, the story still stands up as a favorite. Also, I found myself affected by the ending most strongly, stronger than I ever had before. I think it is because I am a widower and there are reflections of such a fate within the final pages of this tale, though I will say no more on that subject. However, I will say that here Dream is offered possibilities, ones which he refuses, though in time to come many a reader will wish he had done otherwise. It is a sad thing, but in many ways The Sandman is a sad tale, one of a refusal to change. Again, I've said enough. Perhaps more than enough. Notes: This particular collection brings together a few of the short stories of The Sandman, tales which stood alone as a single issue of the original comic though they sometimes had influence or showed a reflection of sorts of the larger, overarching tale. The shorts were often some of my favorite parts of this series, so I am particularly looking forward to this. Mini review: It's interesting to look back at these stand-alone tales and to see how the characters, plots, and/or themes had later influence upon the larger story line. Here we have an aging super heroine who seeks death, a cat telling of how she met the Cat of Dreams and what that entailed, Shakespeare and his traveling band putting on a performance for a most unusual audience, and a tale of the sufferings of Calliope, an ancient Greek muse. All in all pretty strong stories, but still not quite the Sandman's best. 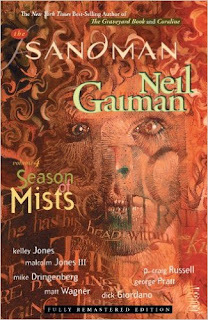 Notes: Here I continue with my re-reading of the entire Sandman collection. At least of the original series. There have been a few mini series and one shots since, and some of those I've read and might get to again. Usually when I post about a comic book or graphic novel I will also list the artists, and in case you're wondering why I'm not doing so with the Sandman books it's because the artists change somewhat frequently. Mini review: Dream has reclaimed the Dreaming and now seeks to find errant dreams. That sentence would probably make no sense except to someone who has read The Sandman. This is a good story, though I would not say it is the best of the series. The issue titled "The Collectors" is a personal favorite, as creepy as that might seem. 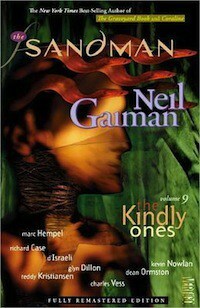 Of all the different stories within The Sandman collection, this one more than any other feels to me as if it is building to something larger, to the story entire (which is still a good ways off to completion at this point); that is not a good thing nor a bad thing, though I suppose it could be both. A number of important characters are introduced here, the Corinthian being perhaps the most interesting. I am glad to be re-reading this series. Notes: I read The Sandman run in DC's Vertigo comics back when it was originally published in the late 1980s and early 1990s, and I've read the collections several times since, though it has been a while. Still, I've never sat down and read all the collections right after one another, which is what I will attempt to do now. 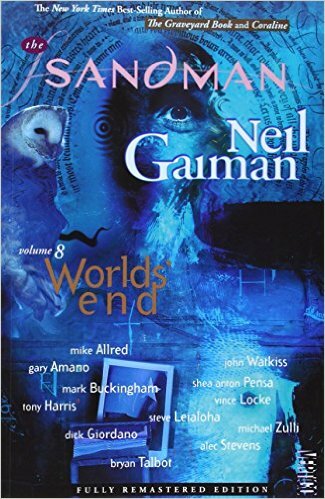 I'm a big fan of this series, considering it not only Gaiman's best writing work but some of the best writing of the last 500 years. I really mean that, when considering the collection as a whole. 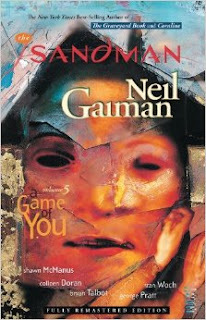 There are portions of The Sandman which didn't work for me as well as other parts, but again, as a whole I believe it is some of the best writing and some of the best fiction to ever be produced by man. Mini review: Pretty much as I remembered it. The first handful of issues are somewhat rough, but eventually the overall tale moves into a fine mixture of fantasy and horror, eventually ending with an upbeat issue. This is not The Sandman at its best, but there are definitely signs of greatness to come. The last issue in this collection is probably my favorite of this lot, though the horror issue in which Dr. Dee takes over a restaurant comes close. If you've not read these, you need to starting with this book. By the way, I'm intentionally giving away practically nothing concerning the plot on purpose. 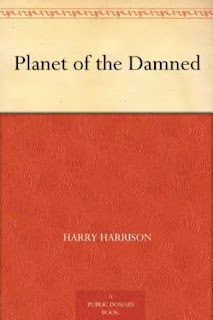 Notes: I've never read much of sci-fi's Harry Harrison, so when I saw this freebie on Amazon a while back, I thought it time to give him a proper try. Mini review: The winner of a planetary contest that involves all matters of skills and combat training goes off to try and save another planet from being destroyed by its own suicidal leaders intent upon war with a neighboring planet. 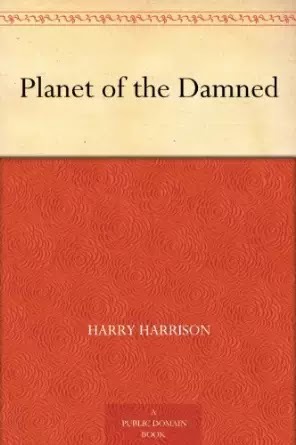 The novel came out in 1962 and it reads that way, but it's still a pretty fun adventure read that keeps the tension high up to the very last moment, and even beyond. Fans of '60s sci-fi should appreciate this one. 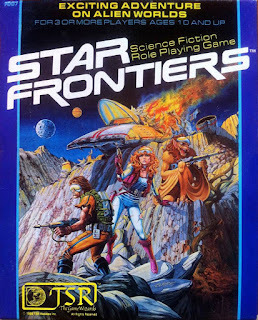 In 1982 the company TSR (the original publishers of D&D) released the science fiction/space opera role-playing game known as Star Frontiers. 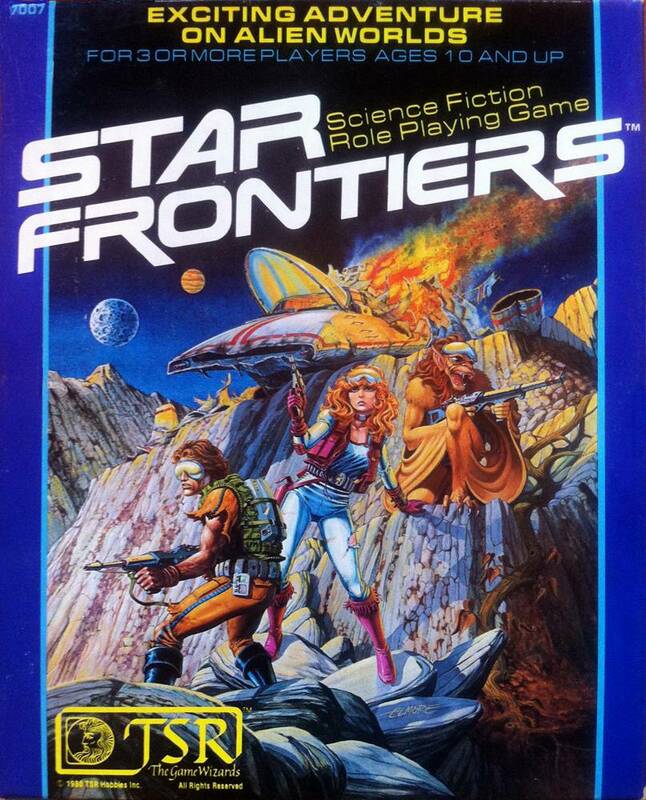 Unfortunately the game only lasted a few years, yet it was somewhat popular during its time. I discuss in my weekly article at Nerdarchy.com. Notes: I was looking for some crime fiction and wanting to try a new author, so I decided upon this novel. Mini review: At first I found the writing clunky, the action unrealistic, and the characters generic if not outright cliched. But I'm glad I stuck with it. About halfway through, everything seemed to improve. 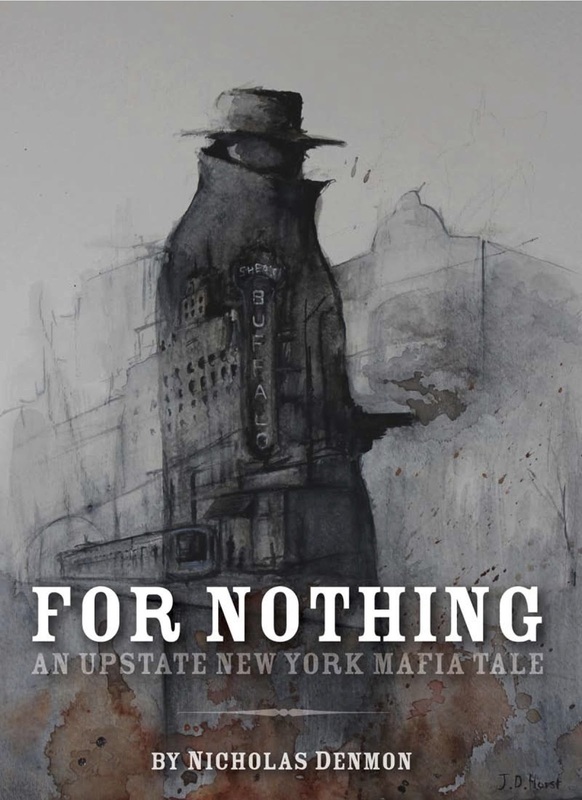 The gist of the story is a cop infiltrates the mob to hunt down an assassin who killed the cop's friend. The story gets much more complex than that, and the writing and characterizations improve, and in the end it wasn't such a bad tale. Glad it got better. The ending leaves room for a sequel, so I might have to check it out. I'm talking about D&D and being a Dungeon Master and how one can run a game off the cuff without any planning. This and more at my weekly Nerdarchy.com article. Notes: I interviewed this author a number of years back, and ever since I've been meaning to try her historical drama set in the art world of the 19th Century. Here goes. 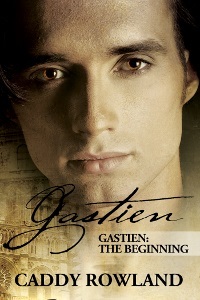 Mini review: This was a fun story, following Gastien through his early life while suffering the brutalities of his father at home on the farm and then eventually making it to Paris to begin his life as an artist and as something of a cad (though he wouldn't call it that). Notes: I'll let part of this novel's description tell why it drew my interest: "You have 10 seconds to make a decision: Let a kidnapper take your child, or watch your son die. Choose!" Mini review: A son is kidnapped, possibly murdered. A marriage falls apart. The mother goes off to be away from everyone and everything. Then weird stuff starts happening. 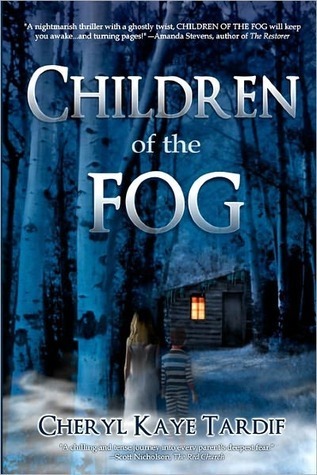 It's not a bad plot, sort of Stephen King-ish, and the writing is pretty good, enough so to keep me reading at a decent pace. However, the characters felt generic to me and the ending was a little too everything-works-out-in-the-end-ish for me. 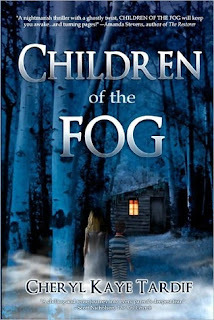 Still, I definitely think this author has talent and will be worth checking out again.